Thrombosis, the formation of a clot inside a blood vessel, can have devastating consequences, including death. Venous thrombosis may be caused by several different factors including: a potential negative side effect of hormone replacement therapies, both cancer and anti-cancer therapies, and airline travel, particularly in those who have a genetic predisposition to clotting problems. Arterial thrombosis is the most common cause of death in North America. It is the underlying cause of the two most common forms of cardiovascular disease, acute myocardial infarctions and cerebrovascular accidents. The most common underlying condition that contributes to an arterial thrombotic event is atherosclerosis, a disease of the arterial vessel walls of medium and large arteries. It is thought that clots form when the plaque formed by atherosclerosis is damaged in some way, exposing the vessel walls and initiating clot formation. Current treatments for atherosclerosis include lifestyle changes, cholesterol medications, anti-platelet medications, beta blocker medications, angiotensin-converting enzyme (ACE) inhibitors, calcium channel blockers and diuretics. In this model, C57Bl/6 mice are anesthetized and the femoral vein is surgically exposed. A thrombus is induced by the direct application of a solution of ferric chloride (FeCl3) to the adventitial surface of the vein. Thrombus formation is measured using intravital video microscopy alone or in combination with a laser Doppler flow probe to monitor vessel occlusion. 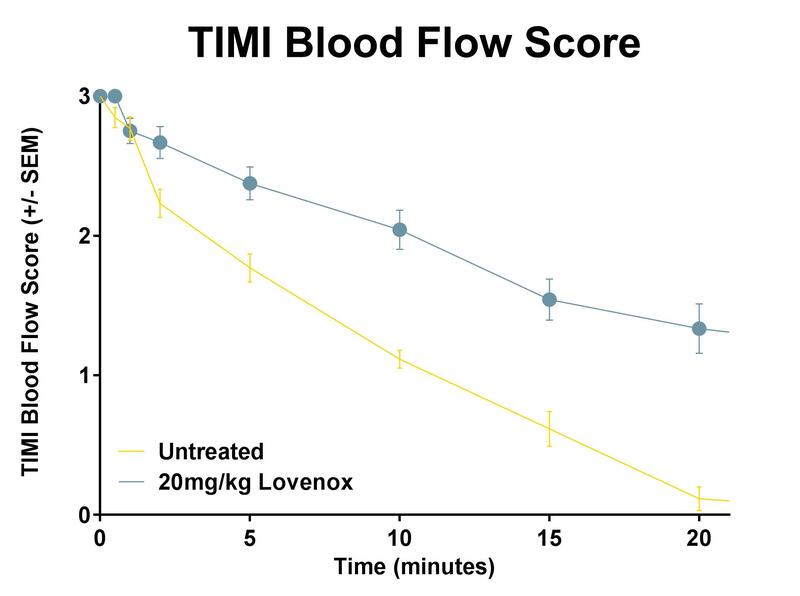 In addition to the primary endpoint of time to complete occlusion, other flow parameters, including a visual evaluation of blood flow using the Thrombolysis in Myocardial Infarction (TIMI) scoring scale, are assessed. This model can be used to evaluate the impact of anti-coagulants, and has been used to evaluate the potential for compounds to increase the propensity for clot formation. 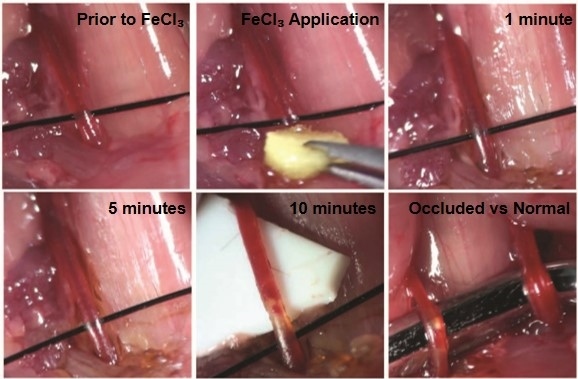 In this model, C57Bl/6 mice are anesthetized and the carotid artery is surgically exposed. 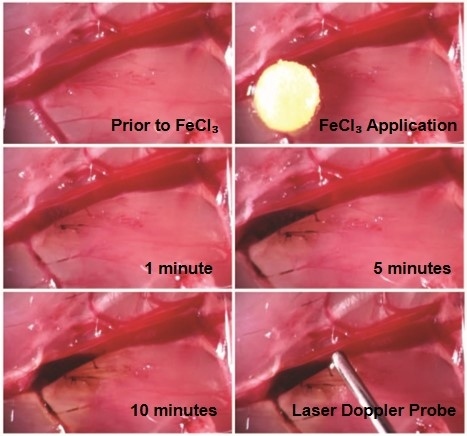 A thrombus is induced by the direct application of a solution of ferric chloride (FeCl3) to the adventitial surface of the artery. Thrombus formation is measured using intravital video microscopy alone or in combination with a laser Doppler flow probe to monitor vessel occlusion. This animal model can be used to compare the anti-thrombogenic activities of novel therapeutics to provide a pre-clinical means of assessing the potential benefits of new drugs and drug combinations in reducing the risk of arterial thrombosis.